Adobe has released After Effects CC 16.1, the latest update to its compositing software, adding Content-Aware Fill for video, expanded support for GPU accleration, and a new Expressions Editor. The release will be on show at NAB 2019 next week, alongside Adobe’s other Spring 2019 updates to its professional video tools, including Character Animator 2.1, Premiere Pro 13.1 and Audition 12.1. The main new feature in After Effects CC 16.1 is a long-awaited one: Content-Aware Fill, a version of Photoshop’s similarly named object removal toolset adapted for use on video. The After Effects version automatically replaces objects within footage with background pixels harvested from other frames within the sequence, or from a clean reference plate. Users have the option to manually keyframe masks around the area of the frame to be replaced, or to use After Effects’ built-in tracking tools, and there are different removal modes for objects and logos. Suggested use cases include gear removal and editing out the camera rig from 360° video. The results look good in Adobe’s relatively simple demo scenes, but how well the toolset performs on more complex shots, or where larger areas of the frame need to be removed, remains to be seen. It supports line numbering, matching brace highlighting, code-folding, and auto-completion for common syntax. Both the look of the editor and the auto-complete options are customisable. Adobe’s ongoing program of GPU acceleration for After Effects’ key features continues, with this update adding support for the Roughen Edges and Change Color effects at 16-bit and 32-bit colour depths. GPU-accelerated debayering of RED footage is also now “functional” on macOS. Workflow improvements include automatic font syncing via Adobe Fonts when moving from one machine to another, and the option to export guide setups for reuse between projects or in Premiere Pro. There are also a number of smaller changes: one handy tweak is that when applying motion blur to a layer, you now get the option enable motion blur automatically for the entire comp. 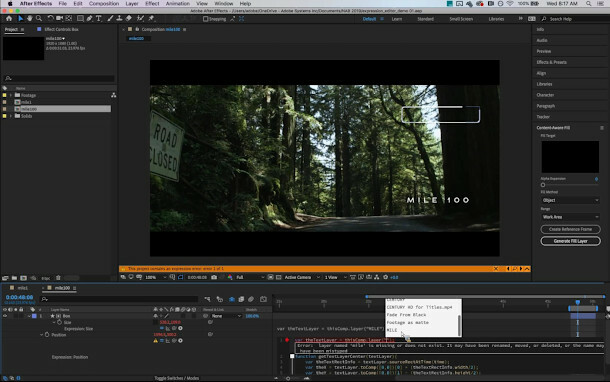 After Effects CC 16.1 is available for Windows 10 and Mac OS X 10.12+ on a rental-only basis. An annual Creative Cloud subscription for After Effects alone costs $31.49/month, while a subscription to all of Adobe’s Creative Cloud tools costs $79.49/month.